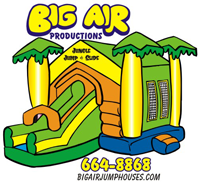 Big Air Productions: Jump Houses, Bounce Houses, Water Slides, Interactives, Royal Castle, Mini Castle, Sports Coliseum, Giant Sports Arena, Jungle Jump and Slide, Paradise Water Slides, 2-Man Joust, Boxing Ring, Soccer Arena, Human Spheres, Moon Shoes, Obstacle Course, Sumo Suits, Double Lane Slip and Slide, Jump House, Bounce House. Inflatable Games. CALL 541 664 8868 or 541 472 6143. 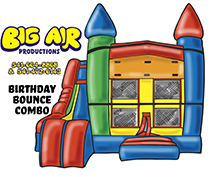 The Birthday Bounce All in One is sure to be a big hit at your next event or party. 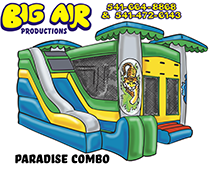 This Combo features a 8' slide, a basketball hoop and a large Jumping area for kids of all ages. It's neutral colors are great for both boys and girls. Paradise Combo is perfect for any event! This Jump house features a 8' slide, a basketball hoop and a large Jumping area for kids of all ages. Great for back yard luau and Hawaiian theme party! This is one giant inflatable! The tropical all in one will host a variety of fun! It includes a basketball hoop, a 13'x15' jumping area, and a huge 16' slide. 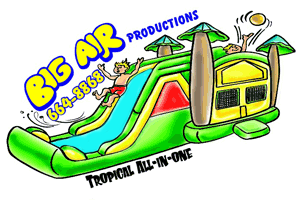 If you can't choose between a sports arena, a jump house, or a slide, this is the inflatable for you! 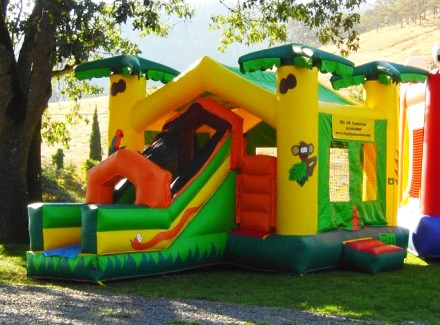 Our Jungle Jump & Slide Can Accommodate Parties With A Lot Of Children. From The Middle Of The Jump House Comes An 8' Slide!! Palm Tree’s, Coconuts, And Parrots Make This One Of Our Most Popular Rentals. A slide & jump house for your Princess! 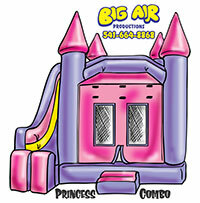 This colorful jump house and slide combo is perfect for the little Princess in your life. (Even if it's just for a day.) 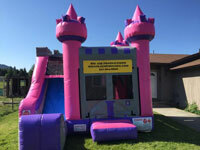 The Princess Combo features a covered roof atop it's large castle walls with an 8' slide. The princess combo is super cute and is sure to make any princess happy!